Being a guitarist is a lot like being an athlete. A certain amount of practice has to go toward general maintenance of your playing on both a physical and mental level. You have to do exercises that will keep your skills in a state of readiness, so that when the time comes to go out and play you can do so in the best way possible. There are also times that you might need to regain a level of fitness after a period of inactivity. General fitness is even more critical if improvisation plays a role in your music, since you don’t know specifically what you’ll be playing when you solo. You have to be able to execute the ideas that come to you, whatever they might be. Being in shape makes is more likely you’ll be able to execute those ideas, rather than try and fail. Below, I’m going to go through some exercises that I do to either keep my lead playing and improvisation in shape, or to regain a level of fitness if I’ve been the musical equivalent of a couch potato. First, I’ll demonstrate some exercises that will keep your fingers moving quickly. 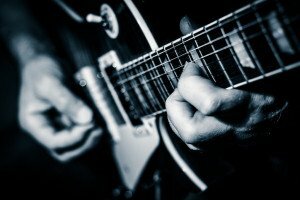 I personally choose to center my speed and technique exercises around scales rather than exercises that target more repetitive finger combinations. I figure, since I’m going to be using scales when I solo, I might as well keep the exercises as close to what I’m really doing when soloing. What scales are you likely to be using in the music you play? Which patterns of those scales are your strongest and weakest? But, I’ve done these exercises over the years with various modal scales, pentatonic scales, blues scales, and other exotic scales I was trying to get under my fingers. First, you can practice playing your scale pattern up and down, from the lowest note to the highest and then back again, with out skipping any notes. Start at a slow, easy speed doing 2 notes per beat and gradually build from there. Once you’ve built it up a little, drop the speed back down and play 3 notes per beat. Build it up more, then drop the speed down again and start doing 4 notes per beat. Continue to build until you reach the speed where your playing starts to break down. Note that you should make increases in your speed at smaller increments than I do in the video. I would suggest going up just 3 to 5 beats per minute at a time. A great way to build on the speed exercise I described in the previous section is to begin changing the number of notes you play per beat. To do this, set your metronome at a speed that is close to, but slightly below, the top speed you ended up with before. Then play the scale pattern up and down, but change the number of notes you play per beat as you go along. Do a couple beats where you are playing 2 notes per beat, then a couple where you are playing 4 notes per beat, then a couple beats where you do 3 notes per beat, and so on. This will really tighten up your sense of rhythm and the different ways beats can be subdivided while you are playing. One of the best things that you can do to make your soling sound better is to diversify and tighten up the rhythms that you play, and this is a great exercise for both. Another way to approach this is to use a drum sequencer to keep time instead of a metronome. Sometimes, I’ll create a drum beat that’s really wild and syncopated, just to try and obscure the beat a little. The problem with the exercises I’ve given so far is that they were only playing the scale pattern in a linear way. If you do these enough, you’ll be great at playing scales up and down, but not much else. So, you need to work on breaking the scales up in various ways. Sequences are excellent for this. A sequence is a repetitive, mathematical pattern that you can apply to a scale that will gradually take you from it’s lowest note to the highest, or vice versa. Here’s one example of a sequence applied to the same C major scale pattern I was using before. In this, I’m skipping up 2 notes in the scale, then coming back one. On the way back down, I’m doing the reverse and going down 2 notes and then up 1. There are some difficult moments in both of these sequences. Those difficulties get your fingers used to doing things that they ordinarily wouldn’t do within otherwise familiar scale patterns, which builds more versatility into your muscle memory. There are a bunch of possible sequences out there you could do. Any mathematical pattern that allows you to gradually make your way though a scale pattern will work. Generally, the larger your jumps are in a sequence, the more challenging it will be. You just have to choose for yourself what sequences will help you most with the music you will be playing. These are just examples. You should still use a metronome when you practice your sequences, and gradually push your speed up. In fact, you’ll notice how there is a timing aspect to all of the exercises in this article, where metronomes, drum sequencers, or backing tracks are used. I believe it’s important to not rely on your own sense of timing with these exercises, and to use something external from yourself to keep you in check. Backing tracks are another good, and fun, tool to use when keeping your chops in shape. While obviously still not the same, they’ll get you closer to the feeling of playing with a band than just about anything else at your disposal when practicing on your own at home. Backing tracks can be a fun way to just jam out and unwind while playing the guitar (and there’s certainly nothing wrong with that), but there are also some more strategic ways you can use them to help your playing. One way to use backing tracks is to use them like a metronome and gradually push your speed. To do this, you’ll need an mp3 recording of the backing track you’re using, and some software (I personally like to use Transcribe) that can speed up or slow down a music track. Take your backing track, open it up in your ‘slow down’ software, and set it at a tempo that is easy to play with as a warm up. Jam over it for a minute or two, and then increase the tempo a bit. Focus on keeping all of your notes strictly in time, almost like the metronome exercise I mentioned above, but also playing in more of a free and musical way. Repeat this process until you’ve bumped the tempo way up and you’re really pushing your abilities to keep up. Note that with most software that changes the speed of a recording, you can push the speed faster than it was originally recorded. I often do that when doing this exercise, since many of the backing tracks out there are either at a slow or medium tempo. This is a great way to get used to soloing over up-tempo songs. It’s also a good way to improve on soloing over chord progressions that involve changing the scales you are using from one chord to the next. Another thing I like to do when practicing with backing tracks is to intentionally jump into playing things that I’m not quite able to execute. This one is a little abstract, but it can be a great way of improving your playing and building a personal style, so bear with me. When I’m playing with one of my bands at a gig or a rehearsal, I try to maintain an awareness of what I’m able to pull off, and I stay within that boundary. I think this is an important part of being a good improvisational guitarist, as long as you work to push those boundaries when practicing. When playing with a backing track on my own, I’m presented with an environment where it really doesn’t matter if I make a mistake. So, I’ll play with total abandon, trying to execute any idea that pops into my head. Sooner or later, I’ll try to do something that I’m unable to pull off. At that point, I stop the backing track, think about what I was trying to do and then practice it a little. Once I have a grasp of it, I’ll turn the track back on and try to incorporate the idea into my playing over and over again. Eventually, it becomes another phrase that is part of my vocabulary. Posted in Practice, Technique and tagged Advanced, Exercises, Improvisation, Intermediate, Metronome, Practice, Scales, Technique.